When confronted with 6-10ft waves under those infamous cliffs, I tend to reach for a trusty 7’8 pin. I love the confidence of a big meaty board, but tend to outrun the pocket of the wave. 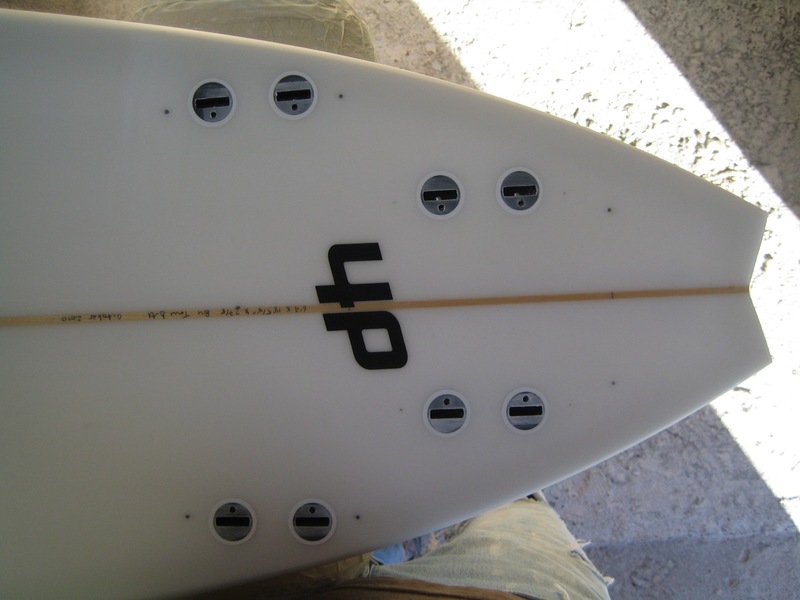 I shaped this board, 6’9 x 18 5/8 x 3″, as an attempt to retain paddle power and gain the freedom of a shorter board and maybe even get to take off inside the boil for once… It has heaps of deck roll leading into the fine rails that I’d have on a 6’5 mini-gun. Fin quantity / position / type was a gamble as well. I’ve been using the FCS TowAB fins (which look like they could be used for surgery…) with large leading double foil and small trailing single foil. Surfed it on christmas day at Aileen’s and again just before new year’s eve in good 8ft waves. Felt really positive dropping in and not wildly loose off the bottom – but I think the fins need changing to have bigger trailers – or be slightly nearer the tail. At six foot crab on new year’s day it felt a bit sluggish so it definitely needs real power and or speed.